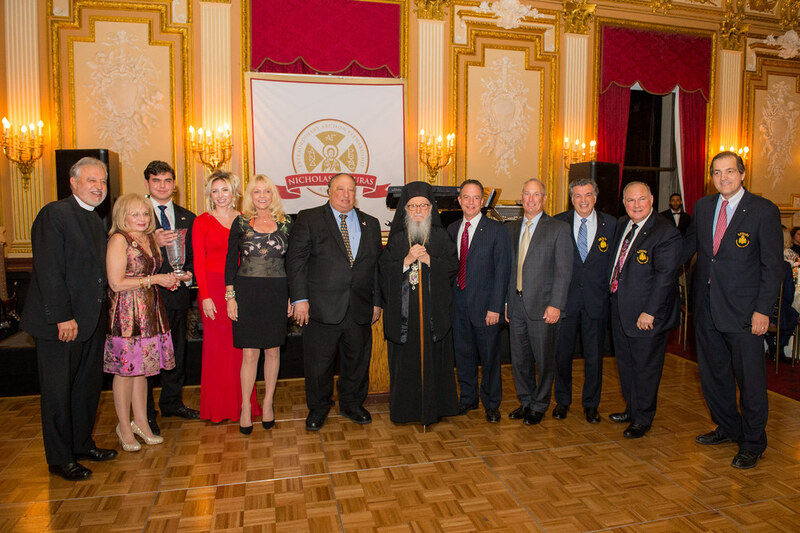 Efstratios Valamios, center, is presented with the Athenagoras Human Rights Award, and joined by [L-R] Dr. Konstantinos Koutras, Consul General of Greece; Archon John A. Catsimatidis, recipient of the Nicholas J. Bouras Award; Archon Reince Priebus; Archbishop Demetrios; National Commander Dr. Anthony J. Limberakis; and Archon Mike Emanuel, Chief Congressional / Senior Political Correspondent at FOX News and evening Master of Ceremonies. His Eminence Archbishop Demetrios, Geron of America, Exarch of the Ecumenical Patriarchate, together with National Commander Dr. Anthony J. Limberakis presented the Athenagoras Human Rights Award to Efstratios Valamios and Emilia Kamvisi. This year's Honorees are completely unique among recipients of the Award; a Greek fisherman and grandmother from the island of Lesbos. The duo does not receive the Award for themselves, but as representatives of the fishermen and residents of Lesbos and the Greek islands who have intervened in the refugee crisis, using their boats and fishing equipment to save thousands of refugees attempting the short but dangerous crossing from Turkey to Greece. More than 800,000 refugees have landed on the tiny island of Lesbos since the crisis began in 2015, and thousands of those have been rescued by Greek fishermen from rickety boats, rubber rafts, and capsized vessels. Archon Reince Priebus introduced the Award recipients, saying, "You didn't do what you did to be nominated for the Nobel Peace Prize, or to receive this Award. You did it because it was right." Not only have the fishermen of the Greek islands, Lesbos being the closest to Turkish shores, saved thousands of refugees, but islanders have opened their homes, their hospitals, their schools, and their pantries to the flood of refugees. The crisis has strained the infrastructure of the islands but also provided an opportunity for the fishermen and their families to demonstrate the Gospel in action, as National Commander Limberakis said, "[in] the martyria of simple fishermen and a humble yiayia, we behold the best of the Christian and Hellenic ideals: philotimo, philanthropia and philoxenia. As too many in the world turned a blind eye to the six million Syrians who have had to flee their homeland, our fellow Hellenes opened their eyes, their arms, and their hearts to the plight of their fellow human beings." Archbishop Demetrios praised the fishermen, stating, "These people have loved the refugees more than themselves... We bow down before this type of love, heroism, and offering to humanity." Upon receiving the Athenagoras Human Rights Award, Mr. Valamios' comments were brief and heartfelt. Of his heroic acts and those of his compatriots, he said, "Every person in the world is entitled to the same respect and help when they are in need. I think we did the least amount possible of what could have been done for these people." 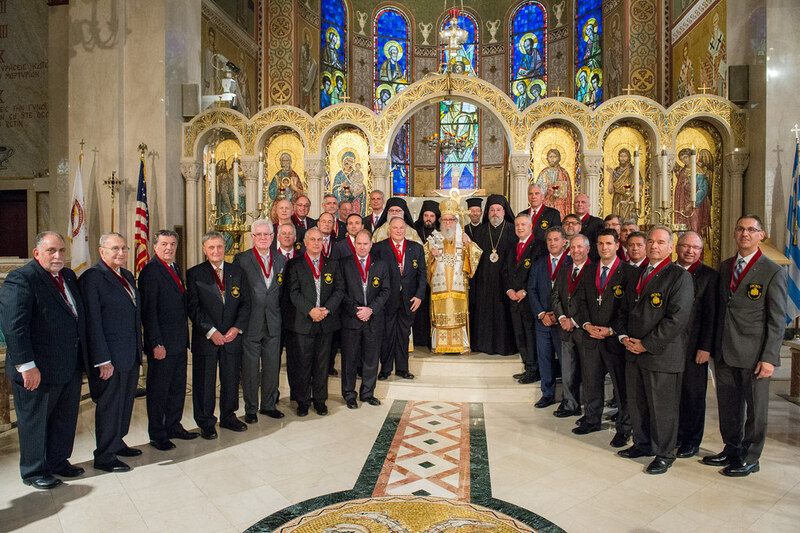 Archbishop Demetrios joined the Order of Saint Andrew in honoring Archon John A. Catsimatidis by bestowing upon him the "Nicholas J. Bouras Award for Extraordinary Archon Stewardship." The Award was presented during a special celebratory dinner dance held at The Metropolitan Club, which launched the Annual Archon Weekend on Friday, October 20, 2017. Mr. Catsimatidis has been an active member of the Greek American Community in New York, throughout the U.S. and abroad. Proud of his New York upbringing and his Greek Heritage, Archon Catsimatidis is the son of Greek immigrants, having arrived in the U.S. at six months old. While pursuing and electrical engineering degree at NYU, Archon Catsimatidis learned the grocery business during his night shifts. Today, John's company, Red Apple Group, is a diversified, international corporation with holdings in retail, energy, and real estate.